December 7, 2015 – Salt Lake City's Complete Streets Ordinance, passed in 2010, (and previously executive order) has been a keystone in making Salt Lake City a more bikeable, walkable, livable, sustainable, and safe city. The Salt Lake City Council will receive a report from the Salt Lake City Transportation Division in their work session on December 8, 2015. What follows is an assessment of various Complete Street projects and the associated bike lanes over the last two years. The Transportation Division has done a great job making a number of new streets bicycle safe and friendly. 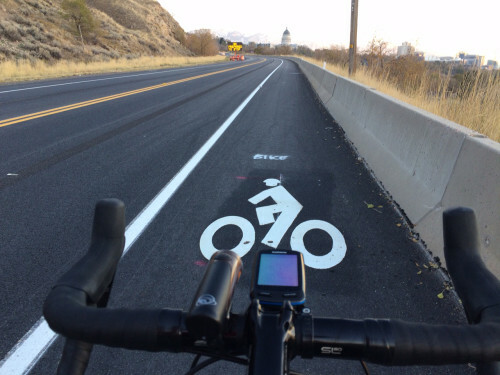 300 South and 200 West are changing the paradigm for safe cycling in Salt Lake City. They will provide a backbone for cycling in the downtown area, and to the University of Utah (when the 300 South route is complete). I urge the Council to continue to support protected bike lanes, as they are needed to bring more cyclists to the streets, and make it safe for riders from 8 to 80. Additionally, 300 South has become a more pleasant street for walking, and helps to make the downtown calmer and more inviting. The 200 West and 300 South is fast becoming a hub for pedestrian and bicycle traffic and will no doubt generate economic development and commercial real estate development in the near future. For now, and for the future, I urge the council to please expand the number of protected bike lanes, and please protect the two we have now. The Review of Complete Streets Installations 2014-2015 mentions a number of other projects. These are to be commended for improving bicycle and pedestrian safety. 200 South is very well done, with new buffered bike lanes between 700 East and 900 East. The method by which streets are considered for bike lanes in Salt Lake City is also to be commended. When a street is resurfaced, if bike lanes can be installed, they are installed. This saves a large amount of money in the long run, since this is much less expensive than grinding out old paint and installing new. There are several concerns and corrections regarding streets that were recently resurfaced and didn't get new bike lanes. This really makes no sense. This is a wide street, with not too much traffic, and the installation of bike lanes should have happened with the resurfacing. There is no good reason to wait 10-20 years for this when this could happen now. Additionally, there’s no reason why bike lanes couldn’t be installed now, weather permitting. 100 South – This street is not mentioned in the report. It was resurfaced in the last year, and should have had bike lanes installed. This is a major downtown street. It is certainly wide enough to accommodate bike lanes and the current number of travel lanes. If a goal is to provide alternatives to cyclists from riding on the sidewalk, then this should be restriped to provide bike lanes. 1300 South – While there are many constraints on this street, it should have had better facilities for cyclists and pedestrians, as should the bridge. This is certainly a more difficult street to work with than 700 S. and 100 S. Additionally, there is room, and need for bike lanes as 1300 South crosses under I-15. State Street – While State Street is a UDOT road, it was resurfaced in 2015 from N. Temple to 3300 South. It did not get bike lanes. This should have been a priority for UDOT to do this, and it is dismaying that UDOT would not install bike lanes even though there is room. Bike lanes could have been installed with a simple lane width reconfiguration. It is often used by cyclists for the same reasons that drivers use it – it is a retail and social destination. State Street is the gateway to Salt Lake City, but it is filled with high speed traffic, air pollution, and is not bike or pedestrian friendly. This should have been a priority for both UDOT and Salt Lake City. A correction is needed in the report regarding Victory Road. Victory Road now has a consistent 6’ bike lane striped on the uphill side, and a 5’ bike lane striped on the downhill side. The road was widened by 2 feet, and lane widths adjusted down to 12’ in order to accommodate bike lanes. The report implies that these will be in the future, but with my working with UDOT, bike lanes were installed this fall. 300 West (between North Temple and 600 North) – This is also a UDOT road, and did not receive bike lanes when it was resurfaced. This should have bike lanes so that the bike lanes on North Temple would connect to the bike lanes on 300 West, north of 600 North. This is another street with plenty of room for bike lanes with a simple lane width reconfiguration. 300 West should eventually have bike lanes from 2100 South to Beck Street. 700 East – This is another UDOT road, and while bike lanes were maintained from 800 South to 2100 South, the buffered bike lane on the west side by Liberty Park lost the ‘buffer’ line. Additionally, bike lanes could likely have been installed between 800 South and around 400 South with lane width adjustments. 700 East is also still very unsafe for pedestrians. 400 South – Another UDOT Road – some accommodations for bicycles should have been made when this was resurfaced. This is a more difficult road because it is both narrow and has heavy traffic. Sunnyside Ave – Sunnyside should have bike lanes in both directions. Sunnyside did receive Sharrow markings in the westbound downhill direction. If bike lanes are not going to be installed in the downhill direction, then enhanced Sharrow markings should be added to improve cyclist safety and visibility. Redwood Road from N. Temple to 1700 North – This is a UDOT road. This section is great in some areas, but missing bike lane markings in others. Note that this a portion of this was repaved in 2013. This section of Redwood should be cleaned up, marked with bike lanes throughout, and reconfigured where necessary, especially from 1000 North to 1700 North. Every effort should be made to make all of these streets Complete. 700 South and 100 South should be done right away. The others should be made Complete soon. My assessment of the shortcomings mentioned above is that there is a need for more planning and engineering staff in the Transportation Division in order to implement Complete Streets on the above-mentioned streets. Investment in this will help to continue to transform Salt Lake City into a Great American Cycling City. This in turn reduces air pollution, increases the health and well being of our citizens, and puts helps economic development since riding a bike is cheaper than driving a car, and the saved money can be spent on goods and services within Salt Lake City. It is also an important transportation solution for our low-income residents. Please consider doubling the budget for bikes in the next fiscal year. This will help to continue to transform Salt Lake City into a more livable, sustainable, and fun city to live in. It will more than pay for itself in reducing health costs and transportation costs, and increasing economic development. Please accelerate the implementation of the recently passed (thank you!!) Pedestrian and Bicycle Master Plan. Please consider adding at least one more planning and engineering position dedicated to bike and pedestrian issues in the Transportation Division. This will ensure that bike facilities can be installed when roads are repaved. The Mayor and City Council need to meet with UDOT to ensure that every UDOT street and road in Salt Lake City (and region 2) is a Complete Street and is bicycle and pedestrian safe. This is imperative if the goals of the Complete Streets ordinance and the Pedestrian and Bicycle Master Plan are to be met. Please install bike lanes as soon as possible on 700 South and 100 South. If a street is resurfaced or rebuilt, it needs to be made into a Complete Street, regardless of the timeline of the Pedestrian and Bicycle Master Plan. Salt Lake City Code and practice should continue to follow NACTO design standards and efforts should be made to encourage UDOT to follow these same standards in Salt Lake City (rather than the less progressive AASHTO standards).